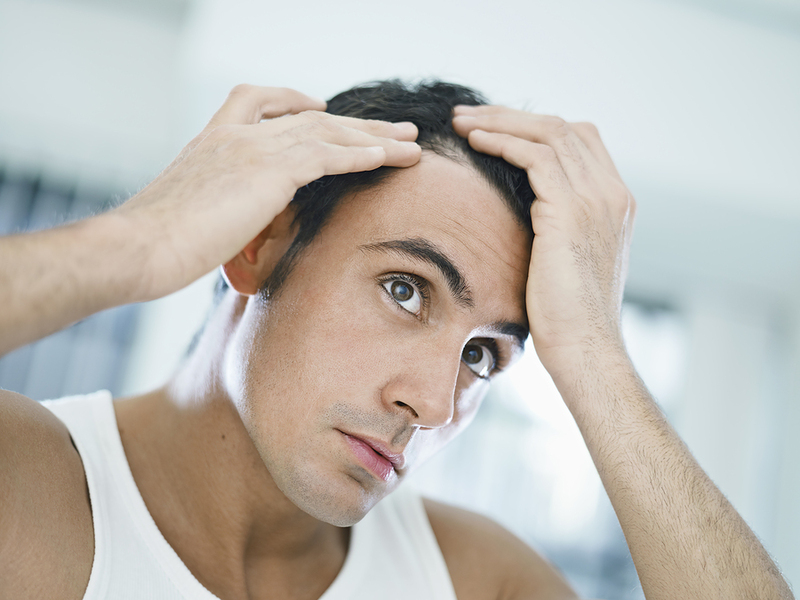 Hair loss is a normal part of aging for men and even for some women. It is estimated that two thirds of men will begin to become bald by the age of 60. The most common form of baldness, called male or female pattern balding, is often controlled by genetics. It has been commonly believed that baldness is passed down through the mother’s genes, but it is now recognized that the father’s genes play a role, too. Women’s hair-loss pattern is different from that of men, in that women tend to have generalized thinning of the hair rather than distinct balding patterns. Hair loss increases with women’s age, as it does with men, but about 10 percent of premenopausal women will start to lose hair. There are many other less-common causes of balding, including some cancer treatments, severe emotional stress, hormonal changes during pregnancy, severe infections, strict dieting, thyroid disease, certain medications and some vitamin and nutritional deficiencies. There is as yet no cure for baldness, but there is an abundance of treatments touted as curing baldness or at least lessening further hair loss. In fact, American males collectively spend around $ billion a year on these products. Most nonprescription treatments, especially those that are not FDA approved, are worthless in spite of the claims and testimonies. There are now two approved medicines for treating baldness. Rogaine (Minoxidil and generics) is an over-the-counter topical solution. It has been shown to be somewhat helpful in halting further hair loss and possibly encouraging new hair growth. It is also the only medication approved to treat female pattern baldness. Both sexes must continue to use this medicine indefinitely. Hair loss starts again when it stops being used. The other drug, Propecia (Finasteride), is a prescription medication, approved only for men and taken as a pill by mouth. It also has been shown to slow or prevent further hair loss. Both Rogaine and Propecia have potential side effects that make it advisable to speak with a doctor before using either drug. – Excessive wearing of a hat. – Frequent exposure to sun. – Use of hairspray and gel. Losing 50 to 100 hairs a day is considered normal. The bottom line is that if you are experiencing what you consider to be hair loss that bothers you, you should talk to your doctor or a dermatologist. Do this before spending a lot of hard-earned money on worthless treatments.